BATTLE FOR THE EAST- Heat Pacers Preview ~ Roundball Manor - The House that Basketball Built. Right now the Pacers have a two game lead on the Heat in the Eastern Conference. The East is coming down to the Heat and the Pacers and all the talk has been "who will have home court in game 7". That's all well and good but it's too early to be talking about that. Everyone fell in love with the Pacers during their torrid October/November, they started 15-1, but ever since the calendar turned to December the Pacers are 3-2. Granted all five games have been on the road but, the Pacers will not be running away with the East and Miami and Indiana will be neck and neck all year for that top stop. 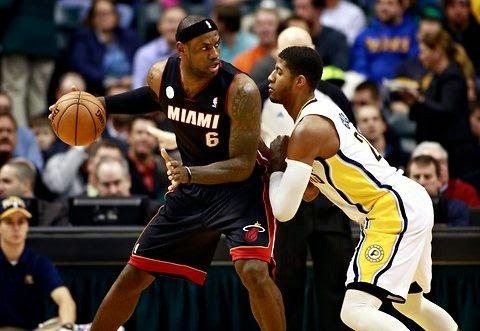 Just as Miami "went through a rough patch", the Pacers will go through one too. Miami just ran off a ten game winning streak and they barely tried. Can you imagine when they start caring? More to the point of home court, these two teams will play each other four times, twice at home. So expect each team to win at home, cancelling out their head-to-head match-up. The home court advantage will come from the 78 other games. So far this season almost every major rotation player has sat a game or two (or five). Erik Spoelstra and the Heat have made it a point that they want everyone to be as healthy as possible entering the post-season, which means some guys will miss games for "maintenance" reasons. There is a good chance Miami will take this game against the Pacers serious and everyone will play, but don't be surprised if Dwyane Wade wakes up with a hang nail and takes the night off. Let's be honest the Pacers are on a mission to get the best record in the NBA. They care A LOT right now, and Miami? Ehh... That's the motto, they might even make T-shirts for the fans. This "ehh" attitude Miami is taking is driving Heat fans nuts, because they are all freaking out seeing the Pacers go full-bore every night. It's making Heat fans even more insane because of the teams they have lost to (Philly, Nets, Celtics, Pistons, and Bulls). Heat fans are spoiled, if Miami isn’t winning by 30 every night, then they aren’t really trying. Last season's 27 game win streak was awful for the Heat fan, because now they expect Miami to win 27 in a row always and forever. And what has that gotten them? Nothing. Let's enjoy Tuesday night's Heat/Pacers match-up knowing this game doesn't make or break anything regardless of what ESPN says the next day. David Alen is a Miami resdient who covers the Heat for Roundball Manor. Follow @DavidAlen on twitter.